Wholesalers and distributors run a tight ship. This business model depends on a massive volume of orders to be fulfilled accurately and shipped on time, every time. The sheer number of transactions involved makes it perfect for using technology. But how about taking it further with mobile technology? Unharness technology and take it out anywhere. We pretty much take technology for granted these days. Desktop barcode printers and handheld barcode scanners in the warehouse. An inventory management solution for the desktops and laptops in the office. What if you could take some of this technology out with you? 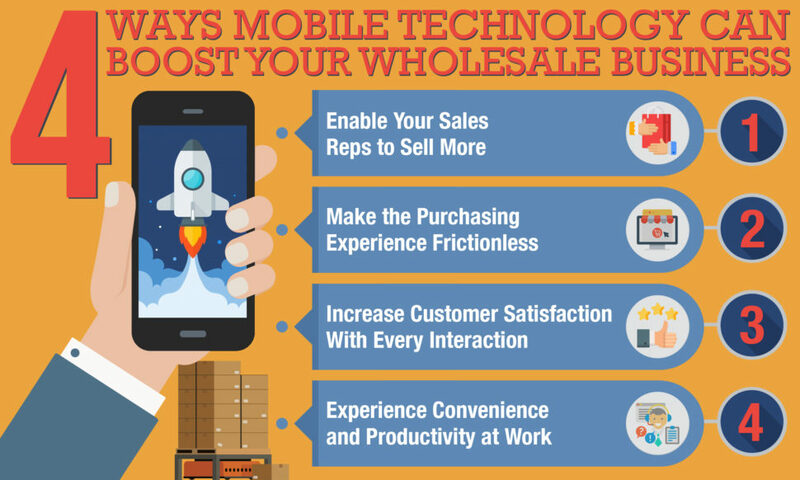 How will it give your wholesale business a boost? Let’s see what are the likely benefits of mobile technology. 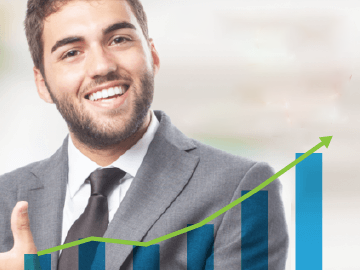 Firstly, increased sales or a higher conversion rate from sales reps in the field. Secondly, an additional sales channel to allow your customers to buy from you 24/7. Thirdly, better service and greater customer satisfaction. Finally, the unmatched convenience and productivity from mobile computing. Your sales reps in the wholesale industry are likely to spend most of their time in the field selling. Some time might be spent in the office calling regular buyers and tidying up paperwork. But most of the time they should be visiting retail customers, building up relationships, gathering feedback and checking on the sales of your products. This is where mobile technology really struts its stuff. 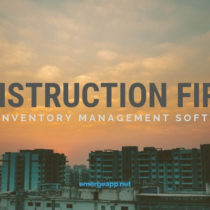 An inventory management software that is a cloud application means that you can work anywhere and anytime that you please. You’re not bound or constricted by desktop apps. All your data stays in the cloud and you don’t need to hunt and search for files saved across different servers or local computers. In the past it might have been enough to give your sales reps laptops and mobile phones. They would then fill in spreadsheets or PDF forms to be emailed or copied to the office server when they were back in the office. But this isn’t really using technology to the max. Mobile technology means that you should be working regardless of your location with the convenience of the mobile Internet. So give tools to help your sales rep sell more in the field. 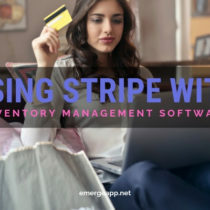 This may include a cloud inventory management software such as EMERGE App together with a laptop or tablet equipped with mobile Internet. Release your sales reps from their desks and have them spend more time where it matters — building rapport and spending face time with each retail customer. With EMERGE App your sales reps have easy and quick access to their customers in the cloud. Just search and click to retrieve a customer record. At the customer overview tab, they will see shortcut buttons to receive payment for invoices or debit notes. They can also quickly create quotations and sales orders while on the go. We know that time is literally money. So we made it easy and fuss-free for your sales reps to get things done. For quotations, they simply choose a customer and then add items. Only two fields are required! They can then download the quotation, email it, generate a PDF document or convert it to a sales order all from within EMERGE App and the same screen. For sales orders, sales reps need only select a customer and add items to create a sales order. We understand that time is of the essence so we made the selling experience as quick and painless as possible. Enter the minimum fields for now and then add more information later when you need to. Purchase button. Places an order for some or all the items in the sales order. Shipment button. Creates a shipment of all the items in the sales order that have not yet been shipped. The stocks and quantity will be deducted from the warehouse inventory. Dropship button. Generates purchase orders for all the items for drop shipping from a supplier. The purchase orders are then issued when the supplier is ready to ship the items to the customer. Invoice button. Creates an invoice for the sales order. Your sales reps can invoice everything in the sales order, add a payment receipt, or choose which items to invoice manually. Cash button. 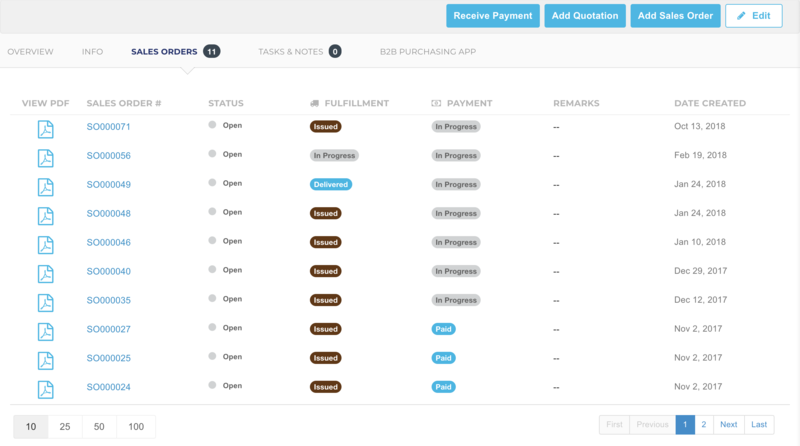 Automatically creates a shipment, invoice and payment receipt for all the items in the sales order. We can also describe mobile technology as freeing your business from the physical and time constraints of your office. What if you could sell 24/7? “That’s not possible,” you say. Well, you can with a B2B e-commerce platform built into EMERGE App. We call it EMERGE Cart. Think of it as a familiar e-commerce shopping site just for your favorite customers. Since EMERGE Cart is essentially a website, customers can place their orders from wherever they may be and whatever time. This is important if you have customers that span different time zones in different states or countries. Customers browse your online catalog, check-out with a shopping cart, and then have their orders entered directly into EMERGE App. To get started, you create purchasing accounts for each of your regular customers. Each customer has their own exclusive and unique login. This means that products and price lists can be customized for each customer. So personalized the purchasing experience for each customer. Tailor and fine-tune your offerings to suit the season or specials. Previously, customers would have to call, email or fax their orders to you. You would then enter their orders into whatever system that you’re using. This is all very inefficient, time-consuming, and data entry mistakes are bound to happen. Now, customers can log in in their own time, select their purchases and then check-out, thus freeing you from the double-entry of sales orders. So, you see, mobile technology can jump from providing benefits for your business to allowing customers to purchase from you as well. 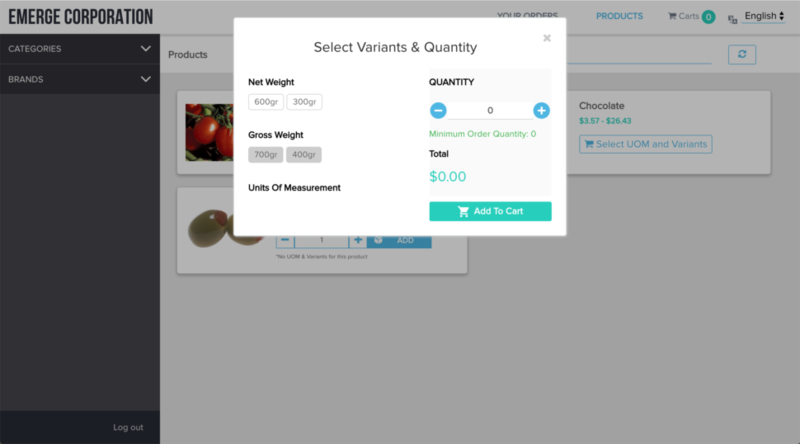 Future enhancements to EMERGE Cart will include giving more self-service options to customers to check their order history and make repeat orders, for example. This frees up the support that you need to give customers and lets your staff focus on selling and resolving pressing issues instead. With today’s mobile Internet, it’s all too easy to take for granted customer service. 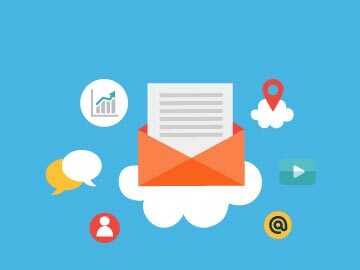 Customers expect more than the usual immediate automated email reply, and then a 1-2 day wait for an actual human response. Increase customer satisfaction, and thus loyalty, by ditching those automated emails and start shortening the response time to customer inquiries. For sales reps, turn your customers into “sticky” ones so that they think of you for their purchases every time. To do this, understand, record and share every customer detail to make each interaction a personal one. EMERGE App helps you do this with a simple customer relationship management system along with a tasks and notes feature. Customer relationship management doesn’t need another expensive piece of software. At the end of the day it’s all about knowing who your best customers are, what they like and growing the business relationship so that they make repeat purchases. It’s just good old fashioned service and personal attention. And you’ll make raving fans of your business in the process! Firstly, understand the totality of your customer at a glance. EMERGE App has a customer overview tab where you can see their contact details, a summary of their sales orders and invoices, and all their recent activities with your business. This keeps everyone in the business well-informed about each customer and their interactions with your business. Plus all this information is kept in one place so that records and documents are not misplaced or saved elsewhere in your business. Next, for sales reps, in particular, the sales orders tab lists all the customer’s sales orders including their status, fulfillment and payment stages. Drill down on individual orders for more details or quickly generate PDF documents. When your sales reps are in the field, they’ll appreciate the convenience of having all this at their fingertips! They can also be confident that this represents the complete business history of the customer with no gaps or missing pieces. Finally, the tasks and notes tab allows you to attach notes or upload files to keep everything you know about the customer in a single place. A central repository avoids the building of isolated data silos in the business. And this lessens the incidence of having individual sales reps keeping customer information to themselves. We know that top sales reps move about. Despite having turnover in your sales team, you should be able to keep most or all of customer intelligence still within the business. With today’s mobile Internet we expect our data to follow us around and not the other way around. We’ve taken our calendars, emails, chats, and documents for granted. That they should be accessible from wherever we are and from whatever device we’re using — be it a smartphone, tablet, laptop or desktop. We apply the same expectations to business software. 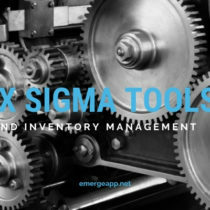 A cloud-based inventory management system such as EMERGE App means that your business software should not be tied to a physical location or be bound by business hours. Take your order, purchase, and inventory data with you and access them at your own convenience. 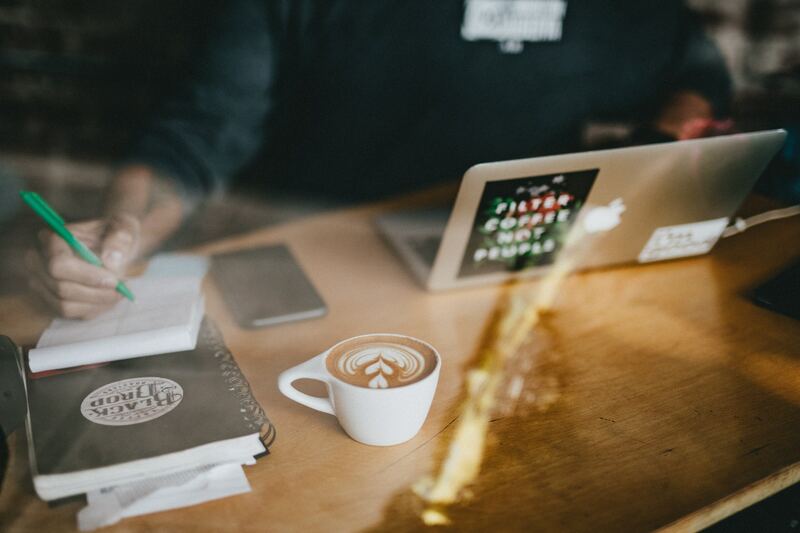 And just like mobile apps that are firmly part of our smartphone life, no maintenance is required to keep your front-end and back-end systems running. In fact, you need not “install” software as you simply access EMERGE App like any other website. The software and all of your data reside on secure, remote physical servers that you need not maintain. Best of all, EMERGE App, like other cloud applications and smartphone apps, updates itself seamlessly in the background. In fact, the team at EMERGE App releases a new version every 3 weeks with new features and bug fixes. And we try to include features most requested by customers too! This lets you focus on running the business and not the software. All in, our philosophy at EMERGE App is to give you what you need to run your wholesale and distribution business. And then get out of the way. We designed the entire user interface and experience to be intuitive and easy to pick up from the get-go. Ideally, we like to say that there’s no training to attend or long documentation to read. You’ve seen how mobile technology features takes information technology in your business to the next level. In today’s competitive landscape, it’s simply not enough to have “technology” in your workflow. 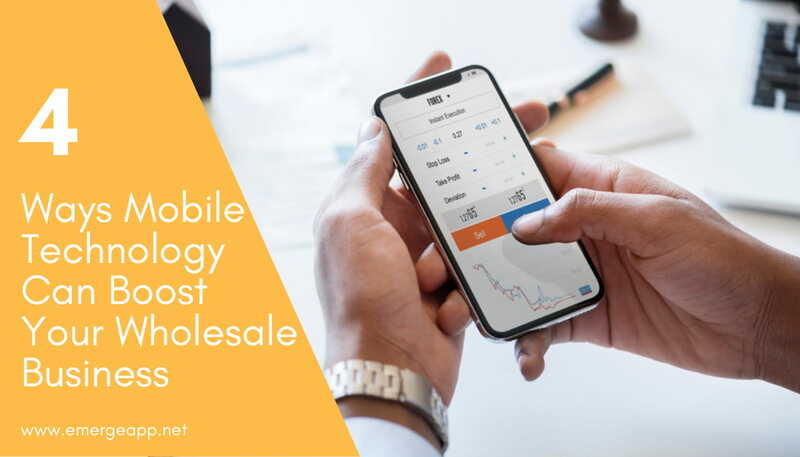 Make it mobile technology and you’ll reap the benefits of increased sales, higher customer satisfaction, and greater productivity at work.